Courtesy of a quick, yet thorough, visit from the pesky injury bug, four “UFC on FOX: Johnson vs. Moraga” have been affected. 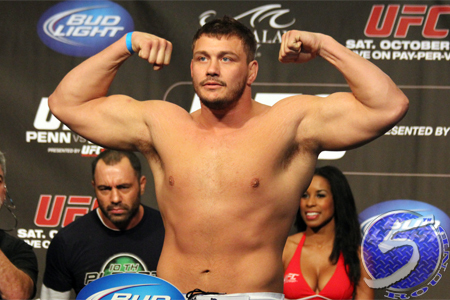 The heavyweight grudge match between Matt Mitrione (pictured) and Brendan Schaub will be rescheduled for another day after Mitrione suffered an undisclosed injury. No word on where the 265-pound scrap will eventually land. Bobby Green has also been forced to withdraw from his shootout against Danny Castillo. Tim Means has agreed to meet Castillo in the July 27 event. Additionally, Tarec Saffiedine is out of his contest with Robbie Lawler. “Ruthless” now fights Bobby Voelker. Finally, for now, Spencer Fisher has been replaced by Daron Cruickshank in his featherweight tango with Yves Edwards. KeyArena in Seattle, Washington hosts the festivities.